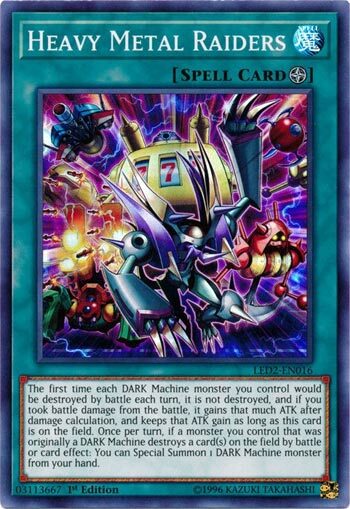 The first time each DARK Machine monster you control would be destroyed by battle each turn, it is not destroyed, and if you took battle damage from that battle, it gains that much ATK after damage calculation, and keeps that ATK gain as long as this card is on the field. Once per turn, if a monster you control that was originally a DARK Machine destroys a card(s) on the field by battle or by card effect: You can Special Summon 1 DARK Machine monster from your hand. All I can think of for this card is Jinzo, even though that card was released in Pharaoh’s Servant and not Metal Raiders. Anyway, Heavy Metal Raiders is a Field Spell Card that protects Dark Machines from the first Battle Destruction it would take that turn, and then pumps them up by that damage amount while it remains on the field. Then, if your Dark Machine destroys a card or cards by battle or effect you can Special Summon a Dark Machine from your hand once per turn. These two effects are good but restricting it to Dark Machines undermines its utility. Heavy Metal Raiders does have future potential because there will undoubtedly be more sets that have Dark Machines. Currently, Genex Ally, Ally of Justice, some Kozmo bosses, Cyberdarks, and other fun decks will gladly welcome the benefits of Heavy Metal Raiders. Heavy Metal Raiders is a Field Spell, so Terraforming. The first time a DARK Machine you control would be destroyed by battle each turn, it isn’t destroyed, and it gains ATK equal to the damage you took, assuming you took damage, and keeps that stat boost while this is on the field. Alright, ok protection for DARK Machines. Not the greatest, but it is fine. Once per turn, if a monster that is originally a DARK Machine destroys a monster in battle, you can summon a DARK Machine from the hand. Nice little swarm effect, would of been nice to get them from the Deck, but then this might be too good. Ok card, not the greatest. If you run a plethora of DARK Machines, this is worth considering. Art: 4/5 Love all of these old school cards in the same artwork. I put together what I hope to be a nice little week here, and Heavy Metal Raiders is a Field Magic card to kick things off. The first effect of this card is probably the best, where each Dark Machine you control isn’t destroyed via it’s first Battle. While on its own, that’s not game breaking, it’s worth noting that the Damage taken by that Monster(s) increases its (their) attack by that amount. So your Monster could easily end up being powerful enough to take down what it was attacked by. The second effect is still good too, where if your (originally) Dark Machine destroys a card(s) by Battle or effect, you get to Special Summon a Dark Machine from your Hand. The Deck and/or Graveyard is usually better, but it’s nice they threw that in their too. It would be cool if this were more generic for all Machines, but still a solid card for a Dark Machine Deck.